With the interesting music release lists getting smaller every week, I am increasingly looking to the new DVD release lists instead. 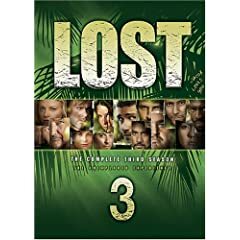 The third season of Lost is the outstanding release of the week for me. Television series releases this week also include the third season of Beverly Hills 90210 and the tenth and final season of Frasier (you can also pick up the entire series). Feature films include Harry Potter and the Order of the Phoenix and The Bourne Ultimatum. Baseball fans (but probably not Yankee rooters) will enjoy reliving their World Series championship with The Boston Red Sox 2007 World Series Collector's Edition, and Barack Obama supporters will relish Senator Obama Goes To Africa. What can you recommend from this week's release list?